The Bridge Engineering Center utilizes three state-of-the-art Iowa State University laboratories when conducting bridge research. The Structural Engineering Research Laboratory is a 6,900 square foot facility with a 80 x 50 ft testing area, a 20-ton overhead crane, and electronic and computer equipment for controlling experiments and logging data. 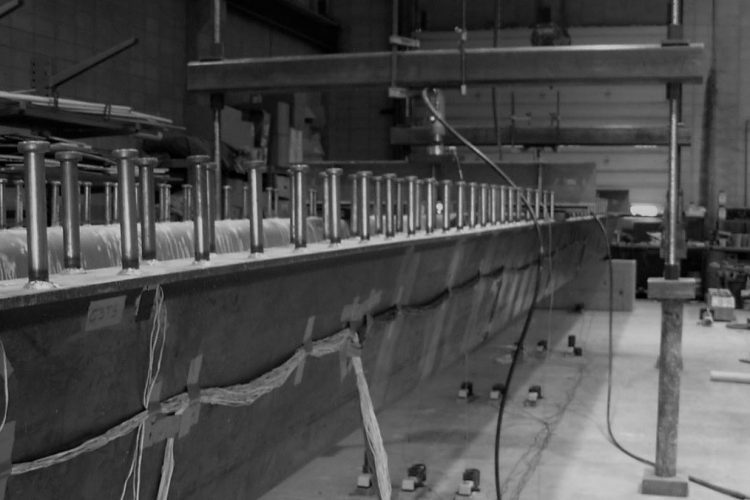 Here, Bridge Engineering Center researchers can perform static, fatigue, real-time dynamic and sequential dynamic load testing in order to research new materials and methods for making structures safer and more cost efficient. Similarly, the Wallace W. and Julia B. Sanders Structural Laboratory, adds to the laboratory space available to Bridge Engineering Center’s researchers. This space houses a 15-ton overhead crane and a 80 x 24 ft reaction floor with 300,000 lb capacity loading points on a 3 ft grid. And located inside the Structural Engineering Research Laboratory is the Livesay Structural Materials Testing Laboratory, which includes ready-to-use materials testing technology like a 400,000 lb capacity universal testing machine for applying tension and compression loading and a MTS 110,000 lb capacity materials fatigue machine for dynamic and cyclic load testing.